Plus, free 6-pc samples from Tom Ford, Oribe, Jack Black, Cariter, Sulwhasoo, Sisley, Viktor and Rolf with any $125 beauty purchase. Disclaimer: Online only. To receive discount offer, enter the promo code DEALMOON in the promotion code box in your shopping bag during checkout. The value of your order must total at least $200 before shipping and tax. Discount applies to select regular-price Beauty and Fragrance merchandise total in USD; Sale and reduced-priced merchandise does not qualify. Applies only to Beauty or Fragrance purchases. Does not apply to Dyson products, previous purchases, or wedding registry items. Not valid with any other discount offer, purchases of the NM Gift Card®, catalog orders, or in stores. Giftnow purchases are excluded from this promotion. Other exclusions may apply. One discount per customer. Limited time offer. Shiseido Eudermine Revitalizing Essence, 4.2 oz. 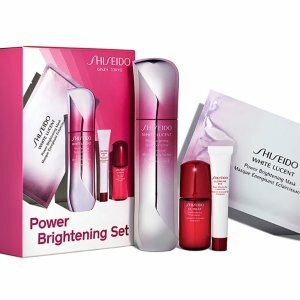 Shiseido White Lucent MicroTargeting Spot Corrector, 1.6 oz. Shiseido White Lucent Luminizing Infuser, 5.0 oz. Shiseido Bio-Performance LiftDynamic Serum, 1.7 oz.